The activities of Tuesday & Wednesday will be discussed and planned at the camp. Watch this space. Part I “Breaking down the Prison Industrial Complex” weaves together the voices of women caught in the criminal justice system, and leading scholars of prison abolition, examining the racial and gendered violence of the prison system. The film features the work of Susan Burton, a formerly incarcerated mother who established A New Way of Life, a group of transition homes for women coming home from prison in South Los Angeles (39 mins). We will be showing a greek film with english subtitles about struggles against C-Type prisons in Greece. Showing on Sunday evening 9.30pm. This film examines a cooperative of the Brazilian Landless Movement (MST) in the South of Brazil, which struggled for access to land and then transitioned to ecological agriculture, or agroecology. This MST cooperative is demonstrating the possibility of an alternative model of flourishing rural life, which provides thriving livelihoods for farmers, produces high quality and low cost food for the region, and rehabilitates the earth. Workshop exploring how the prison industrial complex functions and how it harms our communities. With detailed information about the North Wales Mega Prison Project and its context in a wider prison expansion effort planned by the State. Fracking Workshop providing factual information by a group of concerned citizens with a question and answer session. Come along and find out what it’s all about and why this is the single fastest growing movement of all time. Introduction to plant ID and basic botany, with practical exercises on-site to learn to identify plants. Including a site survey that will contribute to the permaculture design for the camp. Learn how to make rocket stoves – energy efficient, open source and ecologically more sound ways of producing heat. First session of completing a permaculture design for the camp’s new garden. This session will introduce the permaculture design process. We will explore practical surveying and make a base map and field map for the site and prepare for interviews with the residents. An overview of how to plan and undertake actions safely and securely. Including why direct action is effective. Followed by time for action planning as part of the camp. Are you concerned about bugs? About plants dying from mysterious diseases? This workshop will bust all the myths about what causes ill plant health. We will explore practical ways to keep your plants healthy and reduce the chance of disease or crop failure. A session with an organiser who has just returned from Calais. Learn about the situation on the ground and what you can do in solidarity. Presentation on homelessness struggles in Liverpool and Chester by the Love Activists and Soul Kitchen. With a small contribution from the Empty Cages Collective about the links between homelessness and prisons. Come and learn about the herbs that surround us and heal us and how to use them. With Edwina Hodgkinson and Danielle Kay. Police Officers often rely on the lack of legal understanding of those participating in protest. This interactive session will give you the tools to take action more confidently. Learn about food sovereignty. Explore how to use film as a way to document food initiatives, be used as a networking and advocacy tool for small scale farming. Film can also be used as a way to reflect on group processes and share knowledge. Be part of creating a film about the camp. 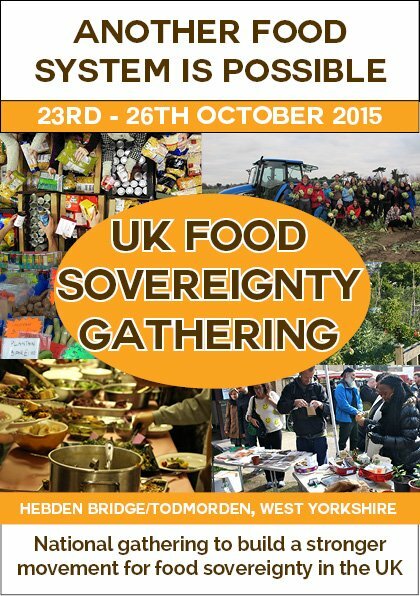 Food Sovereignty Movement | Saturday 11 – 1pm (and repeated through the gathering). A workshop and safe space to explore how we relate to nonhumans and how their prisons (zoos, factory farms, labs and so forth) relate to human prisons. A workshop for beginners on how to be more secure online in your communication and and utilise encryption to keep your files safer. Please bring basic information about your computer so we can answer specific technical questions. A workshop for existing users of encryption and computer security practices. This workshop is to share tools and techniques around encryption, secure communication and safe storage of data. What is anarchism? What is its relevance today, both around the world and here in the UK? 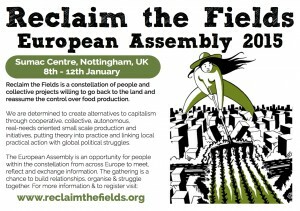 How anarchist is Reclaim the Fields!? A participatory discussion. Legal Observers play a key role at protests. Whether they are handing out key advice on bust cards, or finding witnesses for arrests, legal observers help to ensure that people protesting do not face the legal system alone. This workshop is the full introduction to legal observing and legal observers will be able to use these skills during the actions at the Camp. IPP is indeterminate sentence for public protection; this allows the court to add time onto an existing prison sentence and therefore pushing back the release date indefinitely. The IPP sentence was abolished in 2012, however, this was what not done retrospectively. This left more than 5000 people in jail for a non-existing law with no date of release. Learn about IPP sentences and what you can do as part of the Smash IPP campaign. A workshop giving a comprehensive update on newly proposed nuclear power stations and nuclear waste dumps in the UK. With feedback from the Wylfa/Fukushima Twinning Camp in Anglesey. Come along & find out what we can do about new nuclear together! Introduction to morse code and easy techniques for learning the morse alphabet, numbers and practice. Come and learn how to make camp cough syrup and herbs that keep us strong and healthy through winter. 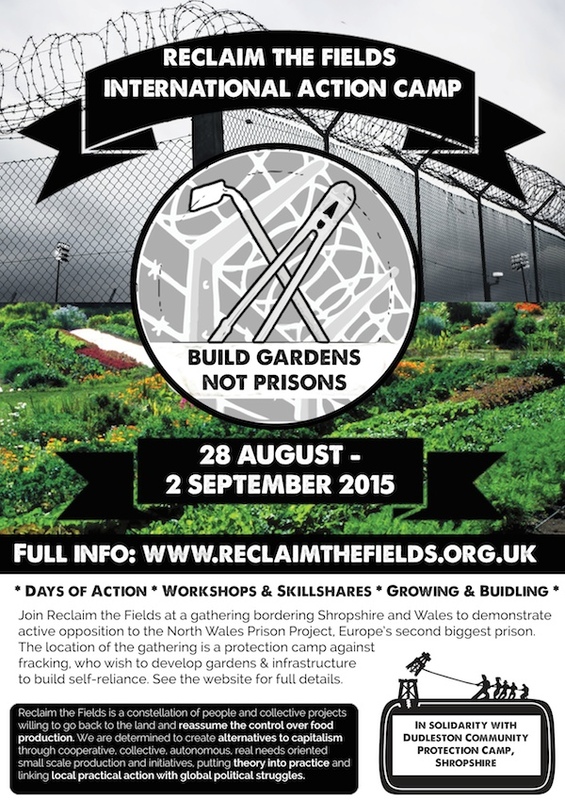 A workshop introducing recent resistance to detention centres in the UK. Followed by a broader discussion about the links between migration and the prison industrial complex. 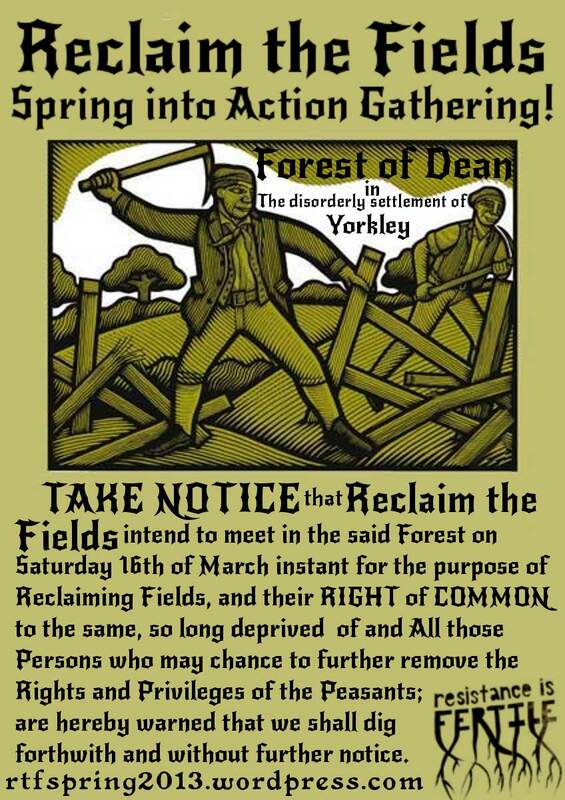 A practical discussion on reclaiming space, occupying land, and what to do with it once you have it. With presentations from projects that have already reclaimed land in the UK and beyond. How does patriarchy, hetero-normative and gender-binary ways of thinking oppress us? Where are we still seeing and experiencing homo, queer and transphobia in our communities of resistance? How does sexism influence our growing projects, permeate our anti-fracking camps, or seep into our campaigns? This is a facilitated workshop exploring how we can ‘compost gender’ for liberation. Find out about the work of the Anarchist Action Network, a network made up of autonomous groups and individuals. Learn about recent successes and challenges and how to get involved. The Turkish government is planning to build thousands of hydroelectric dam including the Ilısu dam, which will flood almost 200 Kurdish villages. We will discuss the strategic and militarist motivations for these projects and the calls for solidarity from Kurdish people struggling against them. The workshop will also highlight the need for solidarity with North Kurdish ecological resistance movements within the context of the wider Kurdish struggle for freedom. Learn about the struggle against the construction of a mega-prison in Haren, Belgium. A talk by Luk Vervaet, former prison teacher and prison activist. Learn about the Badger Cull in the UK – a struggle that relates to the power of industrial and animal agriculture. Learn about how people are practically sabotaging the cull and what you can do to get involved as the cull is expected to get rolled out into new areas of the UK. Explore how to think outside the doctor/hospital paradigm and learn about how to treat emergencies and injuries using traditional and alternative methods. Including herbal first aid. Facilitated session reflecting on the anti- fracking movement & where next. The IWW is a member-run union for all workers, a union dedicated to organizing on the job, in our industries and in our communities. The IWOC is incarcerated people for improved conditions and an end to mass incarceration. We stand with all human beings behind bars. This workshop will introduce the activities of IWOC in North America and then explore if we can do similar work in the UK.